Around the time of my birthday, apricots start making an appearance on the shelves. This causes much excitement in my life. Apricot season in South Africa is very short – only about 4 weeks. In these 4 weeks you will find me making apricot jam, crumbles, tarts, pastries and even occasionally just eating one as is! They add such a juicy, tart flavour and bright colour to desserts. 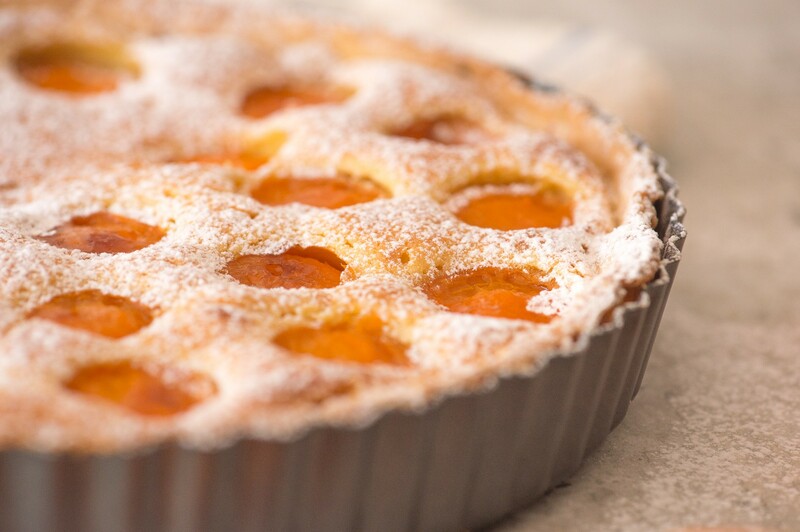 Especially this Apricot, Almond and White Chocolate Tart. This tart is quite similar to my Plum and Almond Tart but I added in some chopped white chocolate. 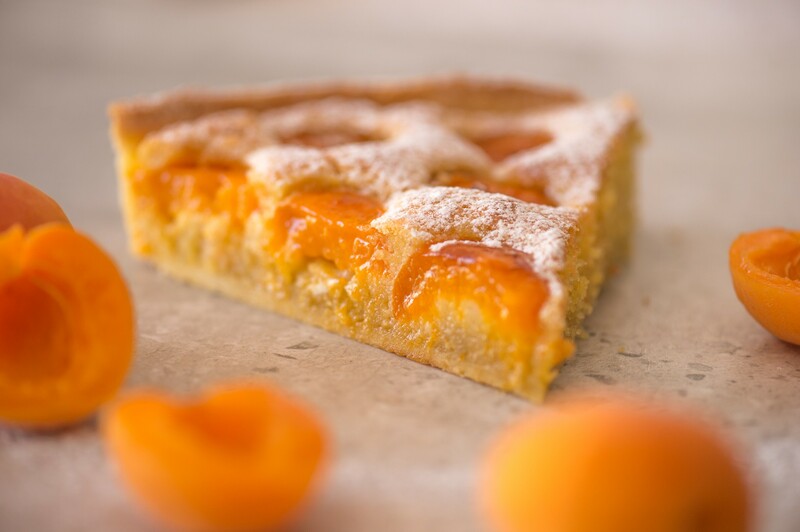 The creamy sweetness from the chocolate balances the tart apricots beautifully. 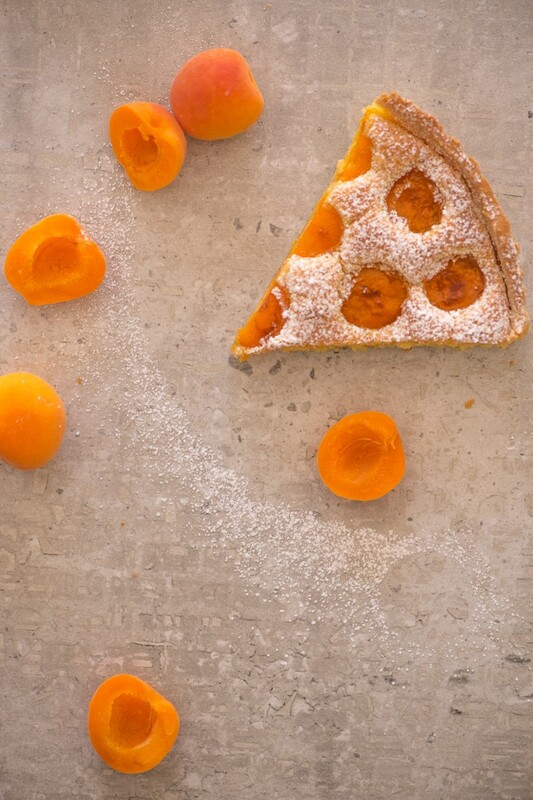 The texture combination of the crisp pastry, soft cakey filling and juicy baked apricots is a winner too. Roll the pastry out to about 4mm thick and use to line a 24cm diameter tart tin (preferably a loose-bottomed tin). Carefully fit the pastry into the tart tin, pressing well into the edges. Roll your rolling pin across the top of the tin to smoothly remove any excess pastry on the edges. To make the filling, beat together butter and sugar until light and fluffy. Beat in the eggs and vanilla extract, mixing well. Beat in the almonds and flour and beat until well combined. Lastly fold in the chopped white chocolate. Arrange the apricot halves onto the filling. Place them close together as they will shrink on baking. Bake at 180°C on the lowest shelf for the first 15 minutes, then reduce the oven temperature to 160°C, transfer to the middle shelf and bake a further 30-35 minutes. This bakes the pastry evenly. Remove from the oven and cool completely before removing from the tin. Dust with icing sugar if desired. *If you prefer to remove the skin from your apricots, you can blanche them first. Pour boiling water over the apricots and leave for 5 minutes. Drain the water off then cover with ice water. Leave for 5 minutes. The skins should come away easily. Definitely next on my ‘must try’ list, Astrid! I love apricots. At this time of year in Canada (November) they’ll be canned, but they’ll still taste good. Now I just have to convert all the grams to cup measurements! Thanks Elke. I’m sure it will taste just as good! I’m always in 2 minds about doing my recipes in cups vs grams. Grams is more accurate but cups is easier! Meant to say this tart was a huge hit. Very easy to make, slices easily and I made some individual (2-portion) tarts in smaller dishes too. No one would have guessed there was white chocolate in the filling, but it made it so creamy. Glad to hear that Elke! Perhaps I should increase the white chocolate content a bit!